This October, the hit multiple Emmy-winning PBS KIDS series PEG + CAT from The Fred Rogers Company is getting the celebrity treatment, as American Ballet Theatre principal dancer Misty Copeland and actress Sandra Oh (Grey’s Anatomy) guest star in debut episodes. A slate of new programming from the animated preschool show kicks off on October 3 with the premiere of THE PEG + CAT MYSTERY HOUR, an all-new hour-long event. Following the special’s premiere, Copeland and Oh will lend their voices to two new episodes. PET + CAT highlights the adventures of the fearless Peg and Cat as they use math and problem-solving skills to overcome challenges and save the day. Since its launch in 2013, PEG + CAT has provided young viewers with new ways to learn the key skills that today’s kids need to navigate everyday life. The new PEG + CAT programming will debut on PBS stations nationwide and be available on pbskids.org and the free PBS KIDS Video App, which is accessible on a variety of mobile devices and platforms such as Roku, Apple TV, Amazon Fire TV, Android TV, Xbox One and Chromecast. 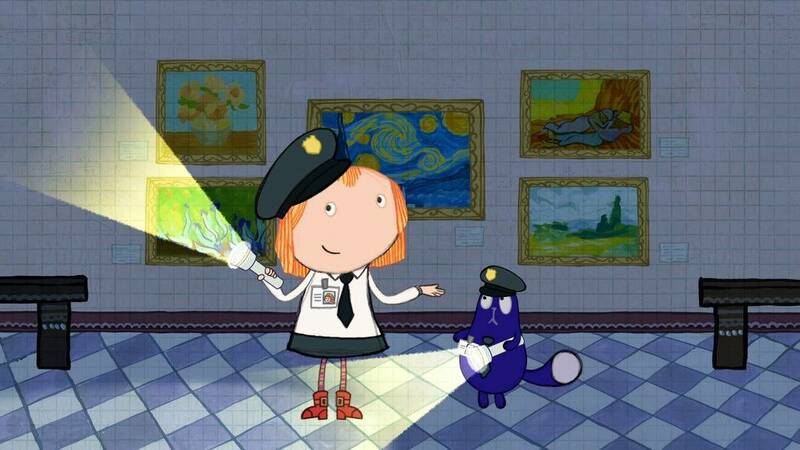 Games and activities from the series are also available for kids on pbskids.org; pre-school and kindergarten teachers can access classroom resources in PBS LearningMedia’s Peg + Cat Collection. Sandra Oh reprises her role as president of the United States (from the PEG AND CAT SAVE THE WORLD movie that premiered on PBS KIDS earlier this year). In the new episode, Peg and Cat travel to Washington, DC, to save the vice president, who is stuck atop a tall national monument. Peg and Cat plan to take the stage to dance with their idol, Misty Copeland, if Cat can overcome one challenge – his tail. PEG + CAT is co-created and executive produced by Jennifer Oxley (Little Bill, The Wonder Pets!) and Billy Aronson (Rent, Postcards from Buster) and produced by The Fred Rogers Company for PBS KIDS. Kevin Morrison of The Fred Rogers Company and Vince Commisso of production partner 9 Story Media Group also serve as executive producers. The series is funded in part by the Corporation for Public Broadcasting (CPB), the National Science Foundation (NSF) Advancing Informal STEM Learning Program, and The Heinz Endowments. The company was founded by Fred Rogers in 1971 as the non-profit producer of MISTER ROGERS’ NEIGHBORHOOD for PBS. In the years that followed, it not only created hundreds of episodes of this much-loved program, but also extended Fred’s values and approach to other efforts in promoting children’s social, emotional and behavioral health and supporting parents, caregivers, teachers and other professionals in their work with children. The Fred Rogers Company continues to build on Fred’s legacy in innovative ways through a wide variety of media, and engaging new generations of children and families with his timeless wisdom. The company’s highly-rated children’s TV series include DANIEL TIGER’S NEIGHBORHOOD, PEG + CAT and ODD SQUAD. For more information, visit www.fredrogers.org. The Corporation for Public Broadcasting (CPB), a private, nonprofit corporation created by Congress in 1967, is the steward of the federal government’s investment in public broadcasting. It helps support the operations of nearly 1,500 locally owned and operated public television and radio stations nationwide. CPB is also the largest single source of funding for research, technology and program development for public radio, television and related online services. For more information, visit www.cpb.org and follow us on Twitter @CPBmedia, Facebook and LinkedIn. The NSF Advancing Informal STEM Learning Program seeks to advance new approaches to an evidence-based understanding of the design and development of science, technology, engineering and math (STEM) learning in informal environments; provide multiple pathways for broadening access to and engagement in STEM learning experiences; and advance innovative research on and assessment of STEM learning in informal environments. The Heinz Endowments support efforts to make southwestern Pennsylvania a premier place to live and work, a center for learning and educational excellence, and a region that embraces diversity and inclusion.